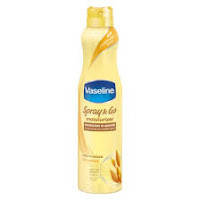 Vaseline Spray and Go Review!!! Can I just start by saying that I LOVE LOVE LOVE this product!!!!! Why do I love it??? 1. I suffer from eczema and staying moisturized is a major concern for me. Anything that helps with that is a major plus. 2. It is designed to spray from any angle!!! Yes, ANY Angle!! Even upside down. 3.There isn't an over bearing scent so it doesn't irritate my eczema!! The spray is continuous and steady. It covers well and leaves no greasy residue! I will definitely by using this product from now on!